With all the rumours, speculation and secrecy surrounding the 50th Anniversary special, it's hard to believe the cold hard facts that we do receive. 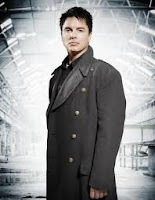 However, this one seems hard to dispute as Captain Jack Harkness himself has confirmed that he is not involved in the 50th via Twitter. 'I will not be involved in the 50th Anniversary Episode of Dr WHO' wrote Barrowman yesterday (March 24). It appears that this is concrete and there will be no more Captain Jack in the foreseeable future. I guess our hopes lie in the renewal of Torchwood.